Although not nearly so well known as the neighbouring Costa del Sol, the Costa Tropical of the Granada province has many picturesque beaches and it is easier to get away from the crowds. The stunning backdrop of mountains all along the coast, along with the absence of tall buildings and other eyesores relating to mass-tourism, adds to the beauty of the beaches themselves. The Costa Tropical is made up of many beaches and little coves with crystalline waters, along 73 kilometres of coastline. With more than 320 sunny days each year and an average annual temperature of 20º C, you can enjoy it all year round. It is an easy drive to the coast, and with the new motorway nearing completion, journey times will soon be even faster. From the centre of Granada it takes less than an hour, whilst the Alpujarras and Valle de Lecrin are even nearer - depending on how close to the motorway you are. The first town you come to is Motril, which is the biggest town on the Costa with a thriving commercial, fishing and leisure port. The town's coastal strip includes two main beaches - the busiest being Playa Poniente, which is well served with tourist facilities, and the quieter Playa Granada. 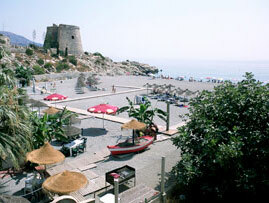 However, Salobreña, the next town along (direction Malaga) is probably your best bet for a good beach close to Granada. You can see it as you approach the coast from Granada - a white town clinging to the sides of an imposing rocky outcrop, crowned by a magnificent medieval castle. What little breath you have left at the end of this uphill climb will be taken away by the spectacular views of the Mediterranean, the mountains and the sugar plantations which proliferate around the town. The beaches are made up of fine stones, and there are good facilities with restaurants and shops along the beachfront. This is a popular destination for Spanish tourists and has so far managed to escape mass-invasion from abroad. Further along the coast towards Malaga you will find many coves and beaches to explore on the way to Almuñecar, the next sizeable town on the coast. One worth visiting is Marina del Este, a pretty and quite secluded beach, with a small marina. This lies just round the headland from La Herradura, and is signposted off the main road (N340) coming from Almuñecar. A map of the beaches along this stretch of coast can be downloaded from the Granada Tourist board website by clicking here.